If this post finds you amid a frantic attempt to resolve a camera error you’ve encountered mid-shoot, take a deep breath and don’t panic. Chances are we can’t help you out of this rut right at this very minute, but the cause of this error can be fixed. First things first: Let’s first rule out human error and confirm that the camera isn’t inoperable due to impact, accidental or otherwise. With that out of the way, let’s assume you’ve run through the list of usual suspects and confirmed that the battery and memory card are inserted correctly, settings are within range for what you’re trying to accomplish, and the lens is properly mounted on the body. Check, check, and check. So what gives? Ah, the dreaded ERROR! Like the check engine light on your car warning you that service is due soon, or in some cases NOW, the various camera errors remind you that something is amiss with your gear. 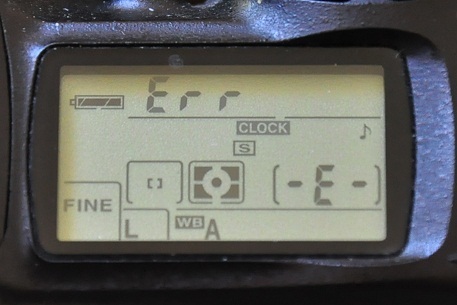 If you play for Team Canon, the infamous Err 99 can elude to a number of different issues as it is a non-specific error signaling a system malfunction (again, much like your check engine light). Most commonly we find that earlier model DSLRs like the Rebel XT and 10D-40D series are suffering from either shutter, mirror box, or lens-to-body communication related malfunctions. The fix? Replacing or sometimes just cleaning the malfunctioning parts. On some newer models DSLRs, however, the error can indicate that the camera’s main power circuit board (PCB) needs to be replaced. You may also run into Err 01 on newer models. This error indicates there is a communication issue between the lens and body. 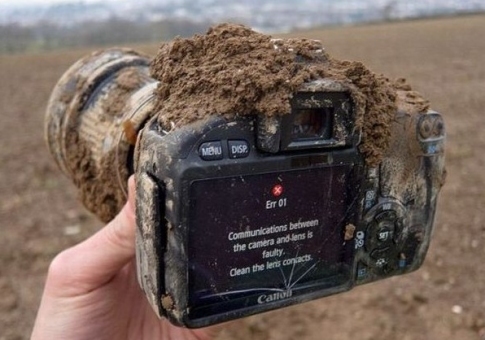 Sometimes this can be fixed by simply cleaning both the lens and body contacts. To be safe, you should provide both the lens in question and your body when submitting the lens for repair. Better safe than sorry! If you play for Team Nikon, you may experience an ERR, Press Shutter Release, or CHA error. 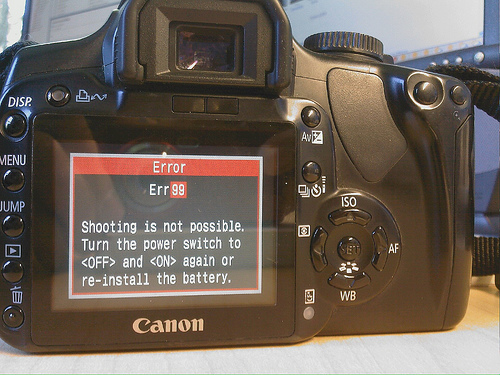 Like Canon’s Error 99, the ERR error signals that a system malfunction has been detected. Plugging the camera into Nikon’s diagnostic software, technicians are able to determine where the fault lies although it is generally quite evident. 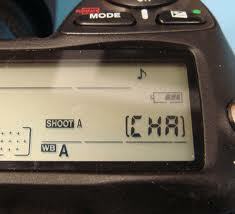 In the case of the Press Shutter Release error, you might expect that your camera requires a new shutter. However, this error is usually indicative of an issue with the body’s circuitry. If you are unable to read/write images on the memory card, you’ll likely notice the CHA error and can expect to have the card reader assembly replaced. Before we jump to the worst case scenario, first try formatting your memory card. WARNING: make sure you have transferred all images from the memory card BEFORE formatting! Bent pins may also lead to a CHA error and would require the pin, or in some cases the entire pin assembly to be replaced. If you’re in a pinch, try using a different card of a different write speed and capacity as not every card uses the same pins. More on this another day! Let’s not forget about Team Pentax! Unfortunately there are no error codes to report; your gear will simply cease to function. Bummer, we know. While a significant portion of errors relate directly to the body, sometimes the fault lies within the lens(es) in use. The best way to rule out whether it is a body or lens issue is to test using known good lenses on your body. If the issue persists regardless of the lens mounted on the body, you can assume that the issue lies in the body. On the flip side, if one lens performs fine while another one causes an error to appear, it’s fair to say that this troubled lens will require repair to get it back in fighting shape. Lucky for you, CRIS is an authorized service center for Canon, Nikon, and Pentax. We provide free estimates and will bring your troubled gear back to life! Next post: Flash Diagnosis: DEAD!